In 2006, Brisbane Airport handled more than 16 million passengers and the privatised Airport’s owner and operator, Brisbane Airport Corporation (BAC), expects this to increase to 22 million within seven years. The Airport is now the second largest gateway for international visitors into Australia behind Sydney Airport and is becoming an engine room for employment, investment and economic growth, with 120 businesses and almost 11,000 people employed on Airport. To balance this unprecedented growth and deliver a world-class airport for one of the world’s fastest growing urban regions, BAC is rolling out a unique vision for Brisbane Airport City, designed to ensure that the Airport has the facilities, the access, the aviation services and the business processes to meet forecast passenger and cargo growth at Australia’s fastest growing aviation gateway. The Brisbane Airport City will, in effect, be a multi-use transport, commercial and industrial hub based on successful international examples such as Amsterdam Airport Schiphol in the Netherlands, Singapore’s Changi Airport and Hong Kong Airport. Brisbane Airport is the largest Airport in Australia in area with 2700 hectares of land, around 1000 of which is dedicated to commercial, industrial and related development. The advantage of size means the Airport City vision has the room and resources to grow in dedicated and master-planned precincts, without compromising critical core aviation facilities. A privately-funded $2.2 billion infrastructure program is well underway and expected to be complete over the next seven to ten years. The program, one of Australia’s largest private sector infrastructure investments of its type ever undertaken, will include a new runway, major expansions to the Domestic and International Terminals, significant upgrades to the internal road system and a second northern entrance to the Airport. The past two years has seen Brisbane Airport’s signature Airport City precinct, Number 1 Airport Drive, come to life. Once complete, the ‘heart and soul’ of the Airport City concept will include a Direct Factory Outlet, an office park, childcare, sports and recreation facilities, public transport including a rail link, convenience retail stores, services, hotels and even an 18-hole golf course. The Da Vinci Centre, Australia’s first airport-based aerospace training technology campus, is also moving ahead with universities, airlines, private training providers and aerospace R&D facilities all currently being developed. The next step in the Airport City vision is to expand on Brisbane’s airfreight facilities through the development of an ‘Air Cargo City’. These developments ensure the region is equipped to capture the economic benefits of sustained growth, while helping to grow tourism, investments and jobs for Greater Brisbane and South East Queensland. As Brisbane City and Brisbane Airport continue to grow at record pace, the region is fast establishing its position as the stand-out cargo gateway in the Pacific. With 26 non-stop international destinations and convenient location to international trading partners such as Taiwan, Singapore, Korea, New Zealand, Hong Kong and Japan, Brisbane Airport is perfectly positioned to be Australia’s airportal. Blessed with modern and efficient facilities, Brisbane Airport has purpose built, cutting edge cargo and logistics capability. An existing dedicated six bay international full freighter apron allows trucks and lifting equipment to operate airside. In line with the growth experienced in passenger numbers, cargo statistics are also rapidly increasing. In the past year, Brisbane Airport has experienced 5.3% growth in imports with 61,308 tons and 8.1% growth in exports, 44,188 tons. The main drivers for Brisbane’s cargo growth are the high-quality facilities that combine efficient and effective systems with fast cargo throughput for the entire supply chain. In the demanding world of air cargo, time is a critical element. Time saved is money made, as the saying goes. A key competitive advantage for Brisbane Airport is its congestion-free, world class terminal operations. 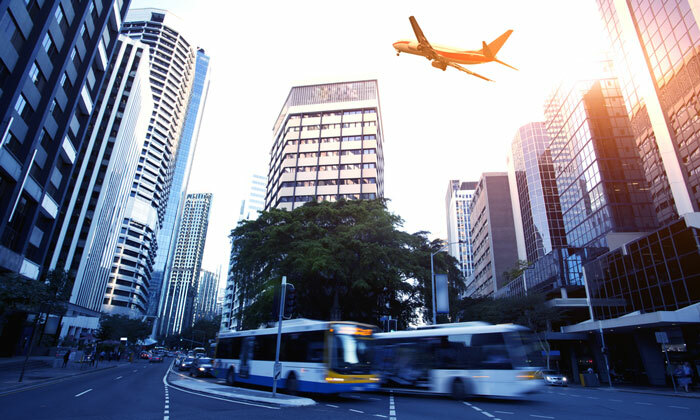 While less than 15 kilometres from the CBD and less than five kilometres from suburban housing, Brisbane Airport is curfew-free – a key advantage for an airport so dependent on the schedules of international customers, airlines and airports. Brisbane Airport is master planned for first line freight users, ensuring the cargo transition between the aircraft and the road network is seamless and efficient. Brisbane Airport’s 24 hour a day operations means freight doesn’t wait, enabling minimal transit times. There is zero congestion airside, at the cargo terminals and road side. For freight forwarders this means more control over the delivery process ensuring that delivery deadlines can be met. Brisbane’s international and domestic distribution system is also timely with import cargo transferred to the road system to connect to Sydney overnight and to other Eastern Seaboard destinations within 18-24 hours. Air Cargo can arrive into Brisbane via a congestion-free national highway at the airport perimeter. Sydney and Melbourne forwarders have the capacity to receive their air cargo directly from the Brisbane originating truck, minimising handling and saving considerable expense in recovery costs and potential days in transit time – not to mention the problems associated with congestion and missed slot times. As part of BAC’s Airport City vision, the cargo and logistics precinct that provides all these benefits, Export Park, will soon be expanding to become an ‘Air Cargo City’. Export Park is the first on-airport development of its kind in Australia. It covers 280 hectares on Brisbane Airport and accommodates major cargo-oriented uses. There is huge capacity for planned growth and unique commercial and lifestyle advantages. Many major companies are already located in Export Park including the Sandvik group, DHL Global Forwarding, Cellnet Communications, Hellmann Worldwide Logistics, Australia Post and Australia Post Logistics, Federal Express and Australian Customs/Australian Quarantine and Inspection Service. The precinct’s proximity to both the International and Domestic terminals expedites distribution of cargo at a rate unavailable within other cities – meaning customers save time and money. The precinct features direct airside access and, like the rest of the airport, is ideally located to take advantage of direct access to the national road networks. Export Park’s existing six bay international full freighter apron will soon be expanded by another 16 hectares to accommodate up to 12 B747F aircraft, a specialist ‘Freshport’ perishable distribution centre and supporting dedicated airside warehouse facilities. Following this upgrade, Export Park will see another expansion to 27 bays in the near future, completing the development of Brisbane’s ‘Air Cargo City’. This one-of-a-kind initiative ensures Brisbane Airport is ideally positioned to become Australia’s premier and preferred cargo gateway airport. Freshport is a new cutting-edge facility proposed development at Brisbane Airport with the potential to provide a significant boost to Australia’s capacity to provide world-class cold chain logistics for the international movement of fresh produce. Once developed, it will be a trading and value-adding hub for the import and export of perishable commodities by air from Brisbane to Australia’s growing markets throughout the world. The Freshport concept represents a new level of ‘best practice’ services to both producers and buyers of perishable commodities throughout Australia, New Zealand, Japan, Taiwan, China, India, Western Europe, Singapore, the Middle East, the Pacific Islands and world-wide. The proposed development represents a major opportunity to suppliers of perishable commodities, retail chains within and outside Australia, airline cargo operations, industry organisations, investors and cold chain operations. Freshport will be a modular design to allow future expansion and additional capacity as the market grows and demand for high quality perishable commodities increases. It will form an integral part of a network of similar corresponding facilities at other airports in the Asia Pacific, Middle East and Europe that form a complete global cold chain system. A unique ‘showcase’ facility will add a new dynamic to the cold-chain process by displaying and centralising under the one roof the full diversity of products on offer. This ‘showcase’ will provide the ultimate in convenience and efficiency for buyers to do one-stop-shopping for Australian and New Zealand fresh produce for their home markets. The new facility would be accessible to all importers and exporters of perishable commodities act as a hub for consolidation of orders, link closely with producers and allow retail-ready packaging and targeted promotions to quality markets. On-site Quarantine and Customs will also ensure regulatory compliance in an efficient manner. For airlines involved in the demanding and growing world of perishable commodity air cargo, time is a critical element. With Freshport’s planned, purpose-built, cutting edge facilities and Brisbane Airport’s zero airside congestion, processing and loading time can be minimised, aircraft turnaround times reduced and aircraft utilisation maximised. BAC has completed a request for proposals and is currently in negotiations to determine a preferred supplier, with Freshport expected to be operational by late 2008. Freshport would serve as a catalyst for processing and value adding industries in and around the airport and the Australia TradeCoast region. Brisbane Airport is a partner in Australia TradeCoast, a strategic government-industry alliance focusing the synergy of the vision of the Airport, the strength of the Port of Brisbane and the commitment and resources of the Queensland Government and Brisbane City Council, Australia’s largest local government body. Australia TradeCoast is the fastest growing industry and trade precinct in Australia, providing unparalleled multi-modal transport links, world-class infrastructure and a level of strategic government and industry partnership that is unique in Australia. It is expected that the new Export Park and Freshport facilities – along with the high quality export channel available through Australia TradeCoast – will act as strong attractions for a wide range of industry. BAC recognises the key role that cargo, or more specifically, the Air Cargo City, will play in the development of its Airport City vision as a whole. Brisbane Airport will continue to draw on innovative technology to provide state-of-the-art freight facilities at efficient and cost-effective world class standards. Investment in partnership with industry in the development and planning of the growing air freight business will assist in securing economic growth for Greater Brisbane and the State of Queensland in the decades ahead. BAC’s aim is to achieve this vision in partnership with stakeholders on and off the Airport and deliver a world-class airport of the future for a world-class city – Australia’s first true Airport City.